"AND THESE SIGNS shall follow them that believe; In my name shall they cast out devils; they shall speak with new tongues; They shall take up serpents; and if they drink any deadly thing it shall not hurt them; they shall lay hands on the sick, and they shall recover.” These were Jesus’ last words on earth, according to Mark’s Gospel (though only in the later manuscripts). Hensley’s fame spread throughout the Appalachian region and soon caught the attention of A. J. Tomlinson, then General Overseer of the Church of God. He ordained Hensley into the denomination (though there is no record of Tomlinson handling snakes, his daughter did). For a decade, Hensley traveled around the region preaching, handling snakes, and drinking poison. At the end of the exhibitions, awed observers would rush down the aisles for the altar call. But Hensley had trouble at home and did not support his family when away on his evangelistic trips. His neighbor began to make obvious overtures to his wife, but she refused to leave her husband. The enraged neighbor attacked the preacher with a knife, beating him severely. Once he recovered, Hensley resigned his ministry, left his family, and reassembled his whiskey still. Before long, he was arrested and convicted for selling his moonshine. On the chain gang he was a model prisoner—until he escaped and fled to Cleveland, Ohio. There he remarried and began to preach again. He and his family moved to Kentucky and again began to handle snakes. He continued to travel, to have marital troubles (he was married four times), and to handle snakes. By the 1940s, the movement had captured both the attention of the national media and the local lawmakers, and the practice was outlawed. But Hensley and his followers continued to “obey God’s law not man’s law.” They were, of course, repeatedly arrested. In the early days of the movement, the bitten were shunned—the person was considered to be “in sin” or lacked sufficient faith. Today most adherents believe even the devout will be bitten occasionally. Believers say God allows snake bites, (1) to punish sins in daily life, (2) to prove the snakes have not been tampered with and are still quite deadly, (3) to try the faith of the victim and other worshipers, and (4) to show God’s healing power. But one of the most common reasons given is that the handler did not have the “anointing.” Snakes must only be handled when a believer is completely under the power of the Holy Ghost: an experience marked by speaking in tongues and physical frenzy. Many receivers of this anointing have no recollection of the experience or even of handling the serpents. The founder of the movement lived into his seventy-fifth year. On July 24, 1955, Hensley was bitten again. Like so many times before, he refused medical treatment. But by the following morning, he was dead. Officials, showing a complete misunderstanding of Hensley’s faith, listed his death as suicide. Serpent handling is a minuscule segment of Pentecostalism—about 0.005 percent—but David L. Kimbrough’s Taking Up Serpents: Snake Handlers of Eastern Kentucky is so good we had to include it. It’s sympathetic and insightfully descriptive. Salvation on Sand Mountain: Snake Handling and Redemption in Southern Appalachia by Dennis Covington, is more of a first-person account. It too is somewhat sympathetic, but Covington (who grew up among the snake handlers) distances himself from the practice at the end. Serpent-Handling Believers by Thomas Burton is another somewhat sympathetic look, but we’ve only read the introduction. Serpent-Handling Believers: The introduction to Burton’s book is available for reading online. An overview of the snake handling movement, including a brief history and summary of beliefs, is available at the New Religious Movements area of the University of Virginia’s Sociology department site. For a suprisingly sympathetic evangelical perspective on serpent handling, see columnist Terry Mattingly’s "Snakes, Miracles, and Biblical Authority,” which compares a snake handler and a church historian. For a senior’s perspective on snake handling, check out "Risking Snakebite Tests Religious Faith" from the Maturity News Service. Ted Olsen is assistant editor of Christian History. 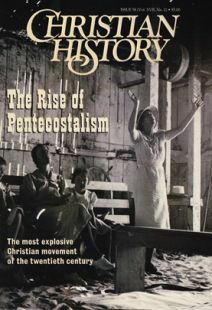 Chronology of the rise of Pentecostalism. Evangelicals were none too eager to welcome the Pentecostals. Aimee Semple McPherson was the first Pentecostal to become a national sensation. The Great ‘I am’ or ‘I was’? An excerpt from a sermon.